In recent weeks I find myself waking in the night anxious about all the "what if"s. I have been trying to refocus on the truth of God's Word by reciting Scripture to myself in the night. Often it is Psalm 23 that comes to mind. But I think that it would be beneficial for me to cultivate a habit of thankfulness during the daylight hours also. So I am going to write a few things for which I am thankful today. 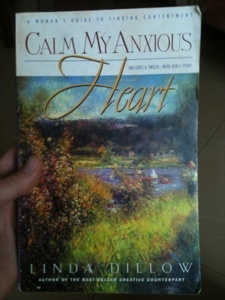 1- a loving Heavenly Father who is working for my good. I sometimes just brush aside how amazing it is that the God who made this world and sustains it, cares for me and is working for my good in the midst of everything! 2- a loving husband who wants to serve others. David has such a servant's heart and it has been beautiful to see that in action here. 3- the ability to go for a run. There are so many people here in Uganda who cannot even walk for one reason or another. This week I met a girl who walks on her knees due to sores she has had on her feet for years. There are also many people who cannot walk due to polio or other diseases. Knowing their stories puts things into perspective. 4- a house to live in. There are many people here in Uganda and all over the world who don't have a house. 5- good food to eat. Yesterday I had porridge for breakfast, but I did cheat and add sugar. I almost finished it, but it made me realized how spoiled I am to have so many options for breakfast. This morning we made French toast. 6- a team that prays together. Yesterday as we met for morning prayer, I was so grateful to be a part of a team who starts the day praying together. Listening to the prayers of those around me was such a wonderful blessing and encouragement! 7- the opportunity to teach. I am loving the chance to do math every day! And it is fun competing with David about who can have the most engaging lesson plan. 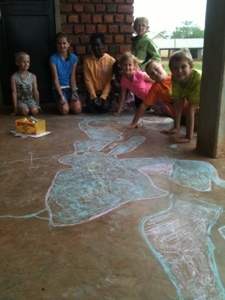 Here is a photo of the day David's history lesson included the kids drawing the Roman Empire in sidewalk chalk. He won that day. 8- beautiful weather. Uganda's temperature usually ranges from the 60s to the 80s. It is so nice and I am enjoying the beautiful breeze we have here by the Nile River! 9- a beautiful countryside! Uganda is such a lush and beautiful place. None of my photos do it justice. I am still working on getting some good photos to share. 10- you! It is so encouraging to know that many of you are praying for us, sending us words of encouragement, and even making sacrifices in order to help support the work we are doing. We are so grateful! I hope you also are able to take some time today to remember how God has blessed you. "Let your mind dwell on these things." Lisa, you are an amazing,inspiring young woman. I so admire you.